Media converters do more than convert copper-to-fiber and convert between different fiber types. Media converters for Ethernet networks can support integrated switch technology, and provide the ability to perform 10/100 and 10/100/1000 rate switching. Additionally, media converters can support advanced features including VLAN, Quality of Service (QoS) prioritization, Port Access Control and Bandwidth Control. These features facilitate the deployment of new data, voice and video to end users. Media converters can provide all these sophisticated switch capabilities in a small, cost-effective device. Supporting the IEEE 802.3 standard, Ethernet copper-to-fiber media converters provide connectivity for Ethernet, Fast Ethernet, Gigabit and 10 Gigabit Ethernet devices. Some converters support 10/100 or 10/100/1000 rate switching, enabling the integration of equipment of different data rates and interface types into one seamless network. iConverter managed copper-to-fiber media converters provide seamless integration of copper and fiber optic cabling, and support a wide variety of network protocols, data rates and cabling media types. iConverter media converters can be used in managed or unmanaged networks. The iConverter media converters are part of a Multi-Service platform that includes transponders, CWDM multiplexers and Carrier Ethernet demarcation devices. Omnitron iConverter media converters are backed with a lifetime warranty and free 24/7 technical support. Copper-to-fiber media converters can be deployed in a variety of networks and applications. In this application, media converters installed in a high-density chassis are used to distribute fiber from a centrally located copper switch to remote locations. At the end of the fiber runs, standalone media converters and compact chassis are used to convert the fiber back to copper for connectivity to switches and workstations. Fiber-to-fiber media converters provide connectivity between multimode and single-mode fiber, and between dual fiber and single-fiber. In addition, fiber-to-fiber media converters support conversion from one wavelength to another, including standard wavelengths (1310, 1550) and CWDM wavelengths. Fiber-to-fiber media converters are typically protocol independent and available for Ethernet, and TDM applications. 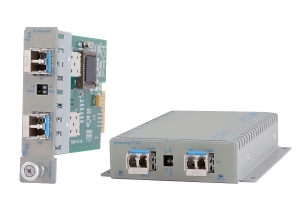 iConverter managed fiber-to-fiber media converters provide multimode to single-mode conversion, dual fiber to single fiber conversion, and fiber distance extension. iConverter protocol-transparent transponders provide standard wavelength to WDM wavelength conversion. 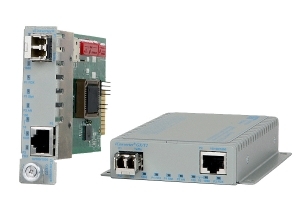 iConverter fiber-to-fiber converters can be used in managed or unmanaged networks. Fiber-to-fiber media converters can be deployed to convert multimode fiber (typically deployed inside buildings) to single-mode to reach remote locations, as shown in the application below. Fiber-to-fiber media converters are also used to convert dual fiber to single-fiber, and as fiber repeaters to extend fiber network distances. Why choose Omnitron Media Converters? Omnitron Systems are world-leading fiber optic media converter experts, with over 20 years in business. Choosing high-quality media converters for your application is critical for network uptime and long-term reliability. Media converters with pluggable SFP fiber optic ports for use with MSA compliant SFPs.